The following commentary is a mix of my own commentary and that from the Livestock Marketing Information Center. Bred cow prices at auctions during the last quarter of 2018 were down 10-20% from a year earlier in key cattle production regions. USDA’s Agricultural Marketing Service (AMS) reported average prices in Georgia auctions for 1200-1300# cows bred 4-6 months earlier at $912.30 per head in December versus an average price in December 2017 of $1119.89, a 19% decline. The same comparison in Montana for mid-aged 1200-1300# bred cows showed a 6% price decline in December compared to a year earlier. 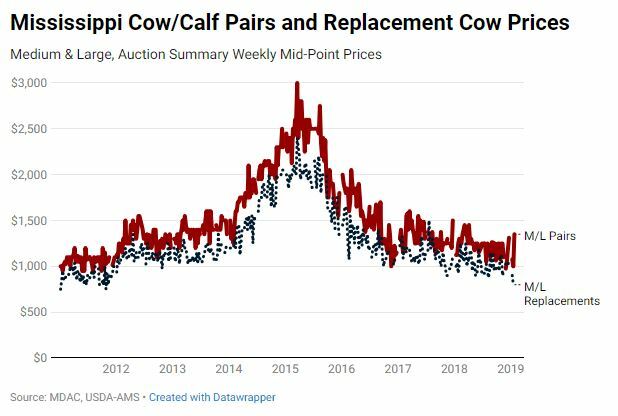 Not surprisingly, Midwest auction cow price changes from late 2017 to late 2018 posted a drop between that of Montana and Georgia, as Saint Joseph, Missouri prices were down 15%. Female prices in Mississippi have been following a similar trend as shown in the chart above. Purchasing a bred cow or any type of female is usually an investment in the future with the goal of earning revenue from her calves. The current lower bred cow and pair prices imply it will not require exceptionally strong feeder calf prices over the next few years for many of those cows to be profitable investments.